This is a bind up of all five of the prequel novellas from the Throne of Glass series. Usually I am not a big fan of short stories but I read the novellas because I hate feeling like I've missed an essential part of the story. The first story in this book was a little slow for me. Though it was an adventure story and things were happening I found it very tedious which is not normally the case for me and Sarah J. Maas's books. However, as I continued with the stories I realised that they got progressively faster paced and all interlinked so as to read all together as one long story. 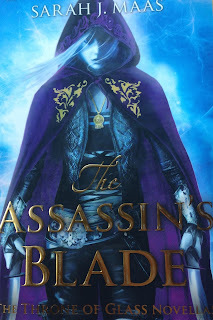 Once I had reached the end of this collection I felt like I knew more about the conditions in which Celaena grew up and how she lived before the first Throne of Glass book. The last two in particular were fantastic. Overall I would say that this collection of short stories is definitely worth reading, give it a story or two to really get into the swing of things but it will get there. I promise.